With the latest LED technology, broken fibres are history in INVIZ DE 2.4 / 4.0 system. What’s more, by activating the turbo mode 25 and more lumen make it possible to inspect upto 4″ / 100mm internal diameter. Two different light optimized optical systems are available(100° FOV und 60° FOV), providing great flexibility for inspection. Accurate colour fidelity, sharp contrast and freedom from noise are standard picture quality with this ground-breaking system. 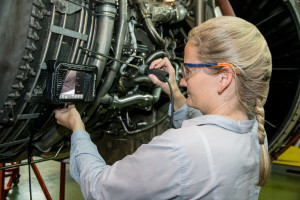 With a width of only 2.4 millimeters the DE 2.4 inspection camera can be easily guided through narrow tube lanes, as they are encountered in nuclear steam generators (including Siemens KWU type) or even in conventional heat exchangers. The world’s slimmest INVIZ DE 2.4 camera system allows a variety of inspections in the smallest spaces. Never before has such a high resolution has been reached with such a small design ! Uniquely the design has ensured that it is possible to carry out both hand-inspection as well as work with manipulators. Alternatively, the higher resolution DE 4.0 system is available with a length of up to 15 meters. The optics can be adjusted by ±30° depending on the application. In addition specialist tools such as grippers, hooks and magnets for recovering lost parts / scrap can be integrated into INVIZ DE 4.0.